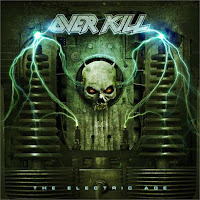 THE METAL ADVISOR: New Overkill Track: "Electric Rattlesnake"
Overkill is back at it with a new track called "Electric Rattlesnake," featured on their upcoming record The Electric Age. The album will released March 27 in North America and March 30th in Europe. Follow the link below to give it a listen. I don't know about you, but I'm stoked. I really like this track a lot! I am freakin' READY for the new Overkill!